The cotton fire retardant fabric produced by Xinxiang Yulong Textile Co., Ltd. is suitable for industries such as petroleum, natural gas, smelting, and machinery manufacturing. Our cotton fire retardant fabric adopts selected long staple cotton as the base material. The fabric has high strength, good abrasion resistance, durability, good air permeability, etc. ; With the unique flame retardant finishing technology of Xinxiang Yulong Textile Co. Ltd, cotton fire retardant fabric has the excellent characteristics of self-extinguishing from the fire, no droplets, and resistance to 100 times of washing. Eastern Europe is rich with minerals, the minerals have driven the development of heavy industry. Machinery, steel, smelting and other industries are the main economic pillars of this region. This time the customer we are meeting is such a friend from the iron and steel smelting industry. 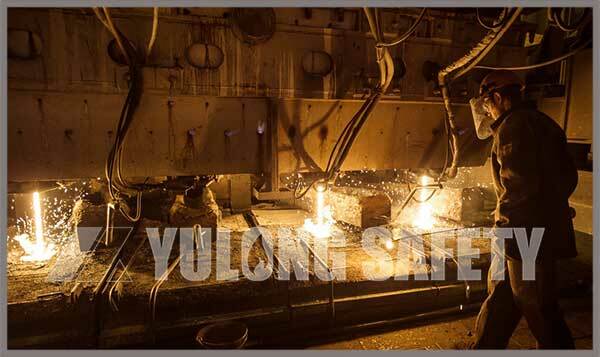 In the metal smelting industry, blast furnace smelting and electric furnace smelting are the two main operating modes. Therefore, it is undoubtedly that the fr clothing made by cotton fire retardant fabric is the best choice, which with heat insulation, flame retardant, and good abrasion resistance. After some understanding, our customers have decided to purchase our cotton fire retardant fabric and have the intention to reach a long-term purchase agreement.